All over America, people are trying to quit smoking, with good reason. Smoke gets in your eyes. Smoking triples the risk of developing macular degeneration! It is a serious eye disease, which is the primary cause of vision loss in older Americans. Reducing or eliminating the habit of smoking and tobacco use can reduce the risk of vision loss. Cigarette smoking also increases the risk of developing cataracts. If you have diabetes, hypertension or heart disease, smoking can increase complications related to these diseases. Smoking also increases the risk for a stroke. Did you know that smoking and tobacco use are the main avoidable causes of sickness and death? You could become one of the 430,700 people who die from smoking related diseases every year. Smoking is a known cause of cancer, heart disease, and stroke. In people age 75 and up, 50 percent of deaths are the result of smoking related illnesses. And, many smoking related illnesses seriously degrade the quality of life of those who suffer from them. 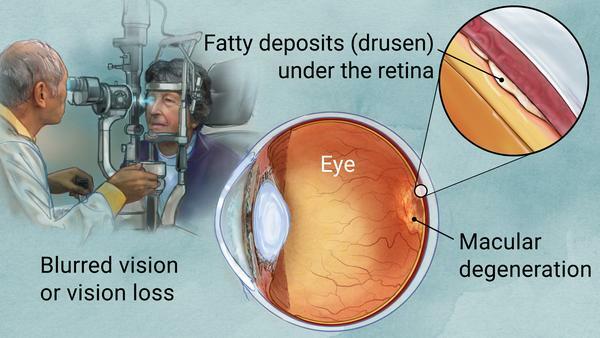 An eye disease that causes permanent vision loss. The risk of developing smoking-related illnesses increases with the number of cigarettes that you smoke and the length of time that you smoke. In fact, children raised in smoking households are more likely to develop asthma and other breathing problems. Smoke can aggravate ocular allergies for smokers and nonsmokers alike. At least 70 percent of those who smoke indicate that they would like to stop smoking. However, if you have tried to quit smoking, you know how difficult it can be. Nicotine is an addictive drug. Quitting is difficult. Most people usually make 2 or 3 tries before they are successful. Anyone can quit smoking regardless of age, health, lifestyle or number of years spent smoking. Programs of smoking cessation are available in your local community. One of three methods used individually or together can increase the odds in your favor: nicotine patch or gum, support groups, and stress management. Ask your primary care doctor regarding programs in your area that can help you quit the smoking habit for good! In addition, you can also check with local hospitals and health departments, which often offer smoking cessation programs. The American Optometric Association urges individuals to not only quit smoking but also to have the eyes examined annually as early detection of disease decreases the likelihood of complications in the future. Click Here to learn more about how retinal photography can help your eye doctor at your next eye exam. Here are some mind-boggling facts about the eyes and some crazy optical illusions. Science facts can be fun! See more.